A new farmer's market debuted this summer in Adams County, Colorado. The market is situated in a food desert and lower-income area of the City of Thornton. The market is located at the Anythink Library on Huron Street every Tuesday morning from July 10 through October 9. This area had no continuous seasonal farmers markets—only a produce booth at the three-day Thornton Harvest Festival. 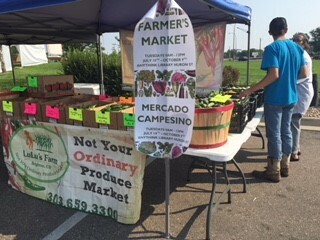 The market is a result of connections and collaborations from the Community Partners for Healthy Mothers and Children grant that ended in May 2017. The collaboration that set the market in motion includes city staff, citizens, Tri-County Health Department staff, Anythink Library staff, Palizzi and Lulu’s Farms, and a generous contribution from the American Heart Association. Subsidizing and serving this market in this location took a very “fruitful” combination of efforts from all of those parties. The Communication Department of the City of Thornton recorded a segment to air on the local channel, the Anythink Libraries produced a press release, and the library’s administration will hold its next meeting during a time the market is open. The American Heart Association presented the concept of a market to a funder who has gave $10,000 to subsidize it. The funds will be used to support the farmer’s expenses for this location, Regional Transportation District vouchers, WIC and SNAP participants, and some of the marketing. Community participation increased from 100 to 250 weekly participants within five weeks. On one market day, three teenage boys came to the market and bought peaches and mangos. They brought their fruit into the library, where the librarian praised them for having fruit for their snack. They replied that they usually stop at the corner market and get chips. Because they saw the farmer’s market, they chose fruit instead! Judy Fowler is the Nutrition Manager with the Tri-County Health Department in Colorado.